NEW BEGINNINGS-IT TAKES COURAGE TO CHANGE ©: THE JOY OF THE LORD IS MY STRENGTH! GREETINGS to you my friends. Isn't it a beautiful day today? I love the season of Autumn! Let us prepare for the Winter months that are quickly approaching! Here are a few topics that will help keep you encouraged and moving within His will for your life that have helped me. Thank you for giving up some of your time to fellowship with me and all the others, to learn in the name of Jesus! Amen. There is so much going on in the world—stuff is just falling apart as the truth is revealed. So much of it is falling on people that had nothing to do with the problem existing from the beginning. Most of it is falling on those that created the lies and manipulation. God’s truth has revealed so much all over the world. Praise You Jesus for being the Light that reveals all places of darkness and replaces darkness with Your Light! Amen. Remember that the people God has called by His name are under His protection and guidance. We all make mistakes. I have truly made my share of them. And as long as I am human—I’ll probably make some more. I know that Going to God asking for forgiveness and also asking Him to help me be the best He has designed me to be is the way to stay humble and teachable. I have learned that, This is the way to mature and grow as I was created to do. I had to get over myself first! So I say to you--Please, get over yourself! Pride will kill you! Learn from your mistakes, and better yourself by seeking God and learning what Jesus came here and did for us. We are to be doing all that He did and more! 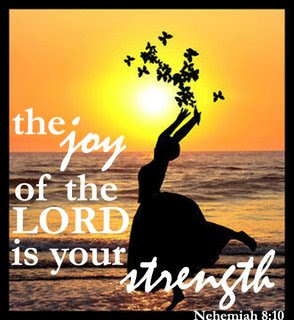 The enemy comes to steal our Joy, our zest for life through Jesus. He does not come to steal our stuff=our homes, cars, jobs and clothes, our material possesions. But if you have put all your trust, faith into material possessions and if you think these things make you secure--then when they are gone--I guess your Joy for life will go with them also. Allowing Him to work with me and break me in the places that I need to be broken in, will help my growth in this life that He has given me. I want to be the best that He has created me to be—not the best by my own little thinking and little wisdom and knowledge. This is for everyone—He said, Who-So-Ever believes in Him believes in the Father that sent Him, and Who-So-Ever obeys, will reap the harvest of God’s Kingdom and the Promises of God will flow to them that do so. We have all gone through things that hurt us and pain us. We have all made bad choices and wrong decisions that have jacked up our lives in more ways than one. Knowing that the hurt and pain-that the bad choices and wrong actions can be used by God to change me and enlighten me - is such a Joy to my heart. I just gotta praise Him! Joyful, Joyful, LORD we adore YOU! God of Heaven, LORD of Light! Healing only works when you clean away everything that is diseased and damaged! So when God comes to clean your wounds with His salve—Let Him do so. The healing process will only work if you are cleaned out! No one puts a band aid on a cut without first cleaning out the bacteria and adding some anti-biotic. God is the same way. He is the Master Healer! In Romans 12:3 Paul tells us that we all have room to grow, and places that need to be broken. May The Wisdom of God be with me as I carry out His assignments given to me to do. May the Wisdom of God guide you and direct you to complete all the assignments that God will give to you. I know what I know by the grace and mercy of God and by the leading of His Holy Spirit. Not that I am better than anyone else as I also fall short and have weaknesses every day. I give to Jesus all my weaknesses and shortcomings so that He is made strong within me and for me. We are to encourage each other through the Love that Jesus has for us. And by His love I do what I do. I gifted myself with none of the talents and abilities that I posses. None of us can claim glory for what we know and what we are able to do. It is all because of God and what He has planted in us that we do what we do as well as we do it! Amen. When we allow God to water, nurture the seeds and weed the gardens that He has planted within us then we are teachable; then we see so much more than we could have imagined. We know who we are and who we belong to. We are able to break our selfishness and pride and allow Him to lead us and do for us as He longs to do. To be joined with others that have other gifts and talents and abilities is the point of His plan. We all have differences that we should celebrate and rejoice in! We are not to be jealous of each other because of our differences of gifts, talents and abilities. But we are to encourage each other, to help each other and to fellowship together. All the while doing so with meekness, humbleness, compassion and understanding for one another. Meekness is strength under control! Yes, I could put people in their places and tell them off when they are wrong and act like fools, but I don’t. They are reacting through emotions and feelings. They speak what their hearts love; from the pride, the hurt the pain, the selfishness, and the coldness. Many people speak and act from the darkness of the fears that live in them. I will not feed my flesh when it raises up hurt and wanting me to get bak at someone who said or did something to me that was totally wrong. Remaining in His Spirit while i take care of the situation is the best way. Many Believers/ Christians love to play show and tell. They tell a lot but show none of the gifts of the Spirit. The fruit of the Spirit will have to mature from it's seeds and grow into fruit. But if people keep feeding their flesh--always being governed by their emotions and feelings, then the fruit will grow some and then rot. And it is no good to anyone let alone God. He will not use rotten fruit to feed any of His people. Or to do any of the work that He has deemed necessary. Some people know they do negative things on purpose and some people have also been more negatively conditioned, but are not able to see it so clearly. To actually check themselves on a consistant basis is not happening. Many people have taken their pain and turned it into a lifestyle. And the way they treat themselves and others in their daily lives is a result of living in the hurt and pain and disappointment since the 'thing' happened. But let me tell you--there is always HOPE! Wanting to be changed is the beginning. And the Love of God has a way of being moved into place by one of many catalysts that He may chose to use in your life. Changes come in stages of a person's spiritual life. Maturity and growth take place within the correct timing. Everything may not change right away. Much of the timing of change is rooted in us. How teachable we become speaks on how quickly changes are accepted and applied in our daily lives. You have to Want to change. And also have to stick with it. It does take time. It happens in phases on different levels within many areas of our personality, our thinking, in our spiritual and our physical being. No matter how long you have been with God-no matter how much you know or don't know about Him; growing in humbleness is what is pleasing to Him. This will breate in you a heart that wants to hear from Him. It opens the way for you to hear and not be offended by Him when He comes to corect you. His correction is His love for us--like a parent for their child. when we say to our children- "No, no, no--don't do that now!" or, " do it this way, it's best for you"
That is how He is with us. If we listen to Him when He speaks. If we take our daily things to Him and ask what does He say about the matter. We are delighting ourselves in Him and His ways. Even seasoned saints of God have trouble waiting sometimes. We are all human and we will be given the opportunity to react by feelings and emotions or by the Spirit. Those of us that truly believe Jesus--speak and act from the faith and love that lives within us. And we are all at different places of growth, maturity and learning. Different places of obedience. There is Much Hope for all that persevere. I chose to re-act to people like that from what lives in my heart. To name a few; forgiveness, compassion, understanding, meekness, mercy and grace and faith and trust in Jesus and God. Is it always easy to re-act this way? No, it is not. But I break my pride and flesh everyday in order to do as we have been instrcted to do. Love unconditionally. And I stay away from people like that as much as possible. Usually these are opportunities to offer prayer to God on their behalf. Which is what I do. Are you stored up on your praises and obedience to His leading on a daily basis? Do you owe God any praise and thanksgiving for anything He has done for you in your past? Have you been spending time with Jesus – strengthening your relationship with God so that you will be under His reign? Have you been humbly and willingly allowing His Love to change you without being rebellious? Have you heeded His warnings and messages when He sends them to you? outtatheblue, to be His Opportunity to Step Into your issues and situations so that He will divinely restore everything to help everyone? We all have the possibility to rise to an higher level of His calling on our lives-(and this is for who-so-ever will believe and obey Him)- We all have to "check in " with ourselves daily to make sure our motives are inline with God's motives. The more that happens from this world-from satan, from the evil that lives in people’s hearts, to undermine my ability to live life abundantly with joy till it overflows-as He said we are to do-the more I go to God in Jesus' name. The more I go to God, the more I expect Jesus to show up. The more I expect Him to show up, the more He Does. The more I go to Him, spending time with Him-the stronger I become. We all have our fears to face and kill off. Consistent spiritual growth and maturity will become evident if we allow Him to do what He can and will do. Every month since I gave my life to God in march of 2002, and totally “stepped out of the boat” on Sept. 21 2006 when I left my teaching career; God Has to come through for me and mine-as there is no one else to help us. That is what we expect from Him and He does provide every day-every month. I stopped worrying and fretting over how much we have and how much we need. Spending my time praising and expecting Him is a better use of it. I thank Jesus that I don't fear money-neither the lack of nor the abundance of it. I and my family have stored up praises and obedience in order to reap from that harvest. We Give mercy and grace as we never know when we may need mercy and grace. There is no particular check list to go by, it is in our hearts that we love Jesus and want to serve Him. God has given us hearts that love Him and seek Him to feed the hunger and the thirst that gathers up in our souls. Thank You Jesus! Learning to live only by His hand is not always comfortable-but we are very glad that we have gone through that refining fire. With each day that arrives we must go through some type of refining fire to be prepared for the rest of the journey. Can't take old stuff with us where we are going. To be tried and tested to be true for Him is what trouble is about. I don't want to carry any burdens that God says I don't need to carry. I give God all the challenges that come cross our paths each day—I see them as opportunities for God to be able to step in and correct the situations and issues that try to take us down and out. Our spiritual savings account that God oversees will never run empty. We add to that account Every day! We all are to have a spiritual savings account with God- and Jesus sits at the head of that board & table. Psalm 68:19 says that God carries our burdens every day, if we give them to Him. I praise our creator for encouraging all of you in your time of need or using you in another's time of need. So many people are afraid to help another in need because of the fears and darkness that live within them. They listen to the darkness instead of the Light that has been given to us. They sow nothing in Jesus' name Unless it is comfortable for them. Unless it is not a burden for them, Unless it is convenient for them to do. So many feel they have to have much in order to help another with their needs. They are mistaken. God gives all of us many opportunities in one day to bear witness to Him in Jesus’ name. We already have the abilities and tools to help others, with a kind word, a prayer and/or praise on another’s behalf. Offering a ride or ‘a piece of change’, as my grandmother used to call it- would do a person a great service of peace. God will provide opportunities for us to help others even when a person may need a bit more than a ‘piece of change’. But so many are more concerned for their needs and what they will not have if they help another. That is a lack of trust in God. I am speaking on the times that the Holy Spirit will speak to you and direct you to do something right at this moment-or that moment. But you think on it a bit too long and the opportunity passes many by. They missed the chance to be obedient, to work-reap and help, all in one. It is selfishness rooted in a ball of fears given by darkness. God does not honor fear, pride, nor listening to the direction of the darkness that lives in some hearts and spirits. May we all continue to be a blessing to one another. I come to tell you to Rejoice in the opportunities that God presents to us. To come face to face with our attitudes and motives. With His teaching and changing us, we will be able to deliberately choose our responses, rather than re-act instinctively to them, which usually ends up being a bad situation for us to deal with. We need to be able to experience the expressed difference between walking in the Spirit and yielding to the lusts of the flesh. Our decisions will result in either the spectacular or the disastrous—there will be no middle ground. Some who are new and at the beginning of Knowing His Spirit, lack maturity and a full understanding. Some that have been with God for many years also fit into this place. This is not a judgment I make –but an observation of the truth of the matter. 1 Cor. 13:11. If we will listen to His voice and obey His leading every time, and not harden our hearts toward Him in rebellion, He will take us through the mazes and messes right to the victory over the enemy of our souls. But if we insist on doing things our own way, we will have to pay the costs; and will suffer the unpleasant consequences of the choices and actions we decided to make. Doing the right thing but through the wrong ways is not going to help you. That is trying to put your ending on what God has started for you. You also cannot put your middle in place of God's divine plans for your life. Interferring and changing any part of what God has given you will delete His plan for you. We cannot add flesh with His divineness and think all will come out as He planned. I don’t know about you—but I have had enough of that way—my way. I stopped relying on my own little understanding and let my pride be broken everyday in order to stay humble lifted high as I stay low, praising Him at His feet. To know that the gifts of the Spirit are not play things but tools for ministry as God leads us forth into our callings is the important point to know. To move forth into growth and strength each day is our part of this assignment. To learn to step out on faith and trust in God is not happening for each Believer each day. That creates strongholds to growth through disobedience. There are believers who have trusted God and have grown in their trust so that when they hear the Voice of God leading them and guiding them they , without hesitation move right away. This is the kind of faith that God honors- obedient faith-radical faith and trust in Him. This is what brings Him glory from our lives. This is what makes God Smile on us and Sing about us. This is why He blesses and establishes us in our going out and coming in; in our rising up and sitting down. He will bring you up higher in your gifting and calling- trusting you with larger works as you have pleased Him in the smaller works that He presented you with. “May the Grace (favor and spiritual blessing) of the LORD Jesus Christ and the Love of God and the presence and fellowship (the communion and sharing together and participation) in the Holy Spirit be with you all!” AMEN! (So be it). God is in the ordinary moments of our daily lives—ready to be called upon to help us in every one of the daily details that apply to us. If you let Him—God Will turn all of your challenges into His opportunities to show His Divine Love for you—And this will move you further along within His Will for your life! He said for us to Enter His Gates with Praise and Thanksgiving on our lips! Not somber, sad, depressed faces and hearts. 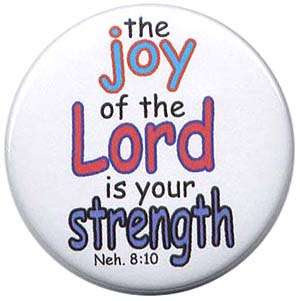 No matter what the case is—Know that the Joy of the LORD IS YOUR Strength!